Tom Mann celebrates his goal with Peterborough Northern Star teammates. Photo: Chantelle McDonald. @cmcdphotos. Peterborough Sports central defender Paul Malone scored his 15th goal of the season to send his side back to the top of Division One Central of the Evo Stik Southern League. 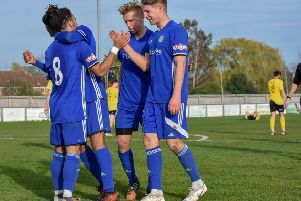 Malone struck in the first-half of a tough game at play-off hopefuls Thame United and then helped a mean defence keep their 15th clean sheet of the campaign. Jake Sansby of Peterborough Northern Star (stripes) in action against Pinchbeck United. Photo: Chantelle McDonald. @cmcdphotos. The 1-0 win moved Sports two points clear of title rivals Bromsgrove Sporting and they have a game in hand. The city side are at mid-table AFC Dunstable on Saturday (March 30) when Bromsgrove have a tough game at fourth-placed Didcot. Sports play their game in hand at Welwyn Garden City next Tuesday (April 2). Peterborough Northern Star delivered a much-improved display last night, but couldn’t end a long run of United Counties Premier Division matches without a win. That runs stands at 13 games after a 1-1 draw at home to Pinchbeck United. Tom Mann opened the scoring for Star with a brilliant 30-yard strike on the half hour mark, but Pinchbeck equalised with a lobbed goal from Chris Shipley that was either a touch of genius or a fluke depending on which twitter feed you believe. Zak Dunn of Peterborough Northern Star (stripes) in action against Pinchbeck United. Photo: Chantelle McDonald. @cmcdphotos. Pinchbeck piled on the pressure late in the game, but Star defended well with goalkeeper Aaron Keir, on loan from Netherton United for the night, making a fine save from Ollie Maltby. The point moved Pinchbeck above Holbeach United into fourth place. Division One Central: Thame United 0, Peterborough Sports 1. Premier Division: Peterborough Northern Star 1 (Mann), Pinchbeck United 1 (Shipley).